WASHINGTON (CNN) -- Could someone without intelligence experience effectively lead the United States' top spy agency, particularly in a time of war? Some are questioning Leon Panetta's nomination to lead the CIA. Two Democratic sources told CNN on Monday that President-elect Barack Obama will nominate longtime Washington power broker Leon Panetta to lead the Central Intelligence Agency. The news provoked strong emotions in political and intelligence circles. Michael Scheuer, a 22-year CIA analyst who worked in tracking Osama bin Laden, likened Panetta to a "political hack" Tuesday. But Panetta supporters describe him as a consummate manager and bipartisan Capitol Hill insider who gets things done without alienating people. The eight-term congressman also has decades of foreign policy experience and was part of the Iraq Study Group, whose recommendations led to changes in U.S. policy in the region. 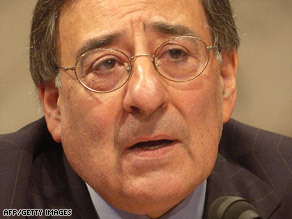 Panetta, 70, also was director of President Bill Clinton's Office of Management and Budget. Although he had not officially nominated Panetta, Obama on Tuesday praised his long service in Washington. "I have the utmost respect for Leon Panetta," Obama told reporters. "[He has] an impeccable record of integrity as chief of staff [under Bill Clinton]..."
Vice President-elect Joe Biden agreed. "I think Leon Panetta is totally qualified for this job. He's been a consumer of intelligence for a long time. He was chief of staff. He understands the agency well," Biden said, adding that the CIA's credibility has suffered in the wake of faulty intelligence on Iraq and other issues. "What the agency needs now is a strong figure who understands how it functions and is going to take it up on a new path..."
But former CIA official Robert Grenier is also skeptical of the nomination. Grenier was once the CIA station chief in Islamabad, Pakistan, where he helped plan covert operations in support of the U.S. invasion of Afghanistan and is now with the investigative firm Kroll. "This is somebody who seems to be coming in from left field. ... I think he has a lot of wisdom based on experience, but this is not someone who really has been in the foreign policy or intelligence game, so I think it took a lot of people by surprise," Grenier said. It's going to be difficult for Panetta "to get a running start" with a job that requires him to "speak in that elite forum with a great deal of credibility right from the start," he said. "I think there is probably a lot that he can learn in a short amount of time, but this is someone who really doesn't know very much about the game as it is currently being played," Grenier said. "And I think that is a particular deficit at this period in time because the CIA is not just being called on to inform policy, the CIA is carrying out policy, particularly in the terrorism field." Criticism on Capitol Hill concerning Panetta was swift Monday evening. "Job number one at the CIA is to track down and stop terrorists. In a post-9/11 world, intelligence experience would seem to be a prerequisite for the job of CIA director," said Republican Sen. Christopher Bond of Missouri, vice chairman of the Senate Intelligence Committee. Democrat Sen. Dianne Feinstein, the incoming chairwoman of that committee, bristled when she learned about Panetta's nomination from the media Monday. "My position has consistently been that I believe the agency is best-served by having an intelligence professional in charge at this time," the California senator said. On Tuesday afternoon, she issued a statement saying that Obama and Biden explained to her why they chose Panetta -- though she didn't detail that reason. "I look forward to speaking with Mr. Panetta about the critical issues facing the intelligence community and his plans to address them," the statement read. But advocates of the nomination say the CIA could use an intelligence outsider for practical reasons that shouldn't be underestimated. Robert Baer wrote a piece in Time magazine praising the nomination. Baer, who had a storied career with the CIA as an operative in the Middle East for decades, is popularly known for having inspired the film "Syriana," which is based on his book "See No Evil." The CIA could use Panetta to "hold off the Senate and House intelligence committees, which are gearing up to rip into the CIA for the last eight years of renditions, secret prisons and bad intelligence on Iraq," Baer wrote. "Mistakes aside, the last thing the CIA needs is another round of overly intrusive congressional hearings like those that so badly damaged it in the '70s. If today's Congress were to deliver a coup de grace to the CIA, the Pentagon would effectively be the nation's only intelligence agency." Most relevant for Panetta's possible new job is that he has been a vocal critic of the agency's interrogation techniques, which Obama decried as torture during the presidential campaign. In an early 2008 Washington Monthly editorial, Panetta wrote: "Those who support torture may believe that we can abuse captives in certain select circumstances and still be true to our values. But that is a false compromise. We either believe in the dignity of the individual, the rule of law, and the prohibition of cruel and unusual punishment, or we don't. There is no middle ground. We cannot and we must not use torture under any circumstances." Sen. Ron Wyden, an Oregon Democrat who is a member of the Intelligence Committee, praised Panetta as a pick to lead the CIA, hoping that if he gets the job, it will lead to the agency being more transparent about its practices. "For too long, our nation's intelligence community has operated under a policy of questionable effectiveness and legality in which consulting two members of the Senate Intelligence Committee counted as consulting with Congress," he said. Some backing Panetta say that his lack of experience in intelligence is less significant because he will largely answer to Adm. Dennis Blair, Obama's pick to be the national director of intelligence. But the director of the CIA still had tremendous power. Scheuer worries that Panetta would hurt agency morale, making agents feel that they are trading a "silk purse for a pig's ear." Panetta would replace Michael Hayden, a retired Air Force general with decades of intelligence experience. Hayden is much beloved for defending agents for doing what "they were ordered to do by the president," Scheuer said. Hayden's most recent predecessors also had intelligence experience. Porter Goss, appointed by President George W. Bush, was a clandestine services officer in the CIA from 1962 to 1971 and chaired the House intelligence committee from 1997 to 2004. George Tenet, first appointed by President Clinton, was on the staff of the Senate intelligence committee from 1982 to 1986 and also served as deputy CIA director. Other critics have noted that apart from his work with the Iraq Study Group, Panetta has had no direct experience in Washington for years. For the past decade, he has been running a think tank in California that bears his name. Even during his eight terms in Congress representing Monterey, California, Panetta did not once serve on the House Intelligence Committee. Panetta's nomination comes after John Brennan, Obama's first choice to lead the agency, dropped out. In a letter to Obama obtained by CNN in early December, Brennan said he was dropping out of consideration for the job because of strong criticism by people who associated his work at the CIA with controversial Bush administration policies on interrogation techniques and the preemptive war in Iraq. The 25-year veteran of the CIA has been the target of liberal bloggers who opposed his potential appointment as the agency's director. He wrote that the criticism would be a distraction from important issues. Brennan defended himself, saying that his critics didn't take into account that he was "not involved in the decision making process" for those controversial policies.